JERUSALEM — Israeli Prime Minister Benjamin Netanyahu's top ministers are squabbling, a deadline looms for contentious legislation that may bring down his government and a corruption indictment could be just around the corner. Against this backdrop, there are growing signs he may soon call for elections — possibly as early as next week, when parliament reconvenes from its summer break. And though Netanyahu hasn't committed yet, conditions appear ripe for him to schedule the vote, nearly a year ahead of schedule. Polls, for now at least, predict a solid Netanyahu victory, one that would assure his place in history as Israel's longest-serving leader and allow him to solidify his close alliance with President Donald Trump. Another term would also allow Netanyahu to push forward with his nationalistic agenda and worldwide campaign to thwart Iran's nuclear ambitions. "It comes down to his electoral prospects and his legal situation," said Avraham Diskin, a political scientist at Israel's Hebrew University. "On both fronts he seems to be doing well for now, so he could easily manufacture a crisis and seize on it for elections." If he gets another term, Netanyahu would most likely build a government similar to the religious, nationalistic coalition he currently leads. A strong showing in the polls could also shield him in the corruption case, the thinking goes, making it much harder for the attorney general to charge a popular, newly re-elected prime minister. Netanyahu's opening speech to the Knesset, or parliament, on Monday could give an indication as to which way he is leaning. On the agenda will be passing a new law mandating the military draft of ultra-Orthodox men, a political hot potato that has deeply divided the government. Israel's Supreme Court has dictated a Dec. 2 deadline to get the law passed and if his divided coalition partners remain inflexible, Netanyahu could use it as a pretext to dissolve parliament. With political parties focused on nationwide municipal elections later this month, Netanyahu's final decision will likely come down in November, which would set up an election early next year. Already, signs of coalition upheaval are everywhere. Naftali Bennett, who heads the pro-settler Jewish Home party, has launched a scathing critique of Defense Minister Avigdor Lieberman's handing of the past six months of violence along the Gaza border, in what is widely seen as a campaign to replace him. Lieberman, who heads the nationalist, but secular, Yisrael Beiteinu faction, is also refusing to bend to an ultra-Orthodox demand that he ease the proposed legislation to draft young religious men. Ultra-Orthodox parties consider conscription a taboo, fearing that military service will lead to immersion in secularism. But years of exemptions have generated widespread resentment among the rest of Jewish Israelis. Earlier this week, Netanyahu held an impromptu press conference, fielding questions from the media for the first time in months in what was viewed as a warm-up for the election season. Cabinet minister Gilad Erdan, a senior member of Netanyahu's ruling Likud Party, said he hadn't heard from the prime minister on his plans. "But it's obvious that when Lieberman and the ultra-Orthodox are hardening their positions about the draft law, we have a problem abiding by the Supreme Court's demand," he told Israel's Army Radio. "You can't run the Knesset and the country when everyone does as they please." If history is any guide, elections look likely. The last time a government served its full term was in 1988. Since then, elections have almost always been moved up because of a coalition crisis or a strategic move by the prime minister to maximize his chance of re-election. A poll aired Sunday on Israel's top-rated Channel 2 newscast showed Netanyahu to be on solid ground. The survey found that, if elections were held today, Netanyahu's Likud party would get 32 seats of the 120-seat Knesset — a two seat jump from its current level — and his current coalition would score a solid majority. The centrist Yesh Atid party would earn 18 seats, while the center-left Zionist Union would trail with 12. The poll had Netanyahu, with 38 percent support, as being the most suitable candidate for prime minister — far ahead of his closest competitor at 12 percent, retired military chief Benny Gantz who has yet to say whether he even plans to enter politics. The Midgam poll surveyed more than 500 Israelis and had a margin of error of 4.4 percentage points. The biggest wild card for Netanyahu is the corruption investigation. Police have already questioned Netanyahu a dozen times and recommended he be indicted on bribery and breach of trust charges in two cases. The first involves allegedly taking gifts from billionaires and the second for allegedly discussing legislation that favored a major newspaper in exchange for positive media coverage. Netanyahu has also been grilled about a corruption case involving Israel's telecom giant. This week, his wife, Sara Netanyahu, went on trial for fraud charges for allegedly overspending roughly $100,000 on celebrity chefs at their official residence, even when there was a full-time chef on staff. Israel's attorney general, Avichai Mandelblit, is expected to make a decision on charges in the coming months. Netanyahu has angrily rejected the accusations against him and his wife, calling them part of a media-orchestrated witch-hunt. His sense of indignation seems to have served him politically, rallying his conservative base in an assault on the supposed liberal elites plotting to get rid of him. Israeli law is unclear whether a prime minister must step down if indicted. Speaking to journalists on Tuesday, Netanyahu refused to discuss the topic, expressing confidence that he would not be charged. But later, his finance minister, Moshe Kahlon, said Netanyahu should step aside if charged, saying a prime minister under indictment "cannot function." 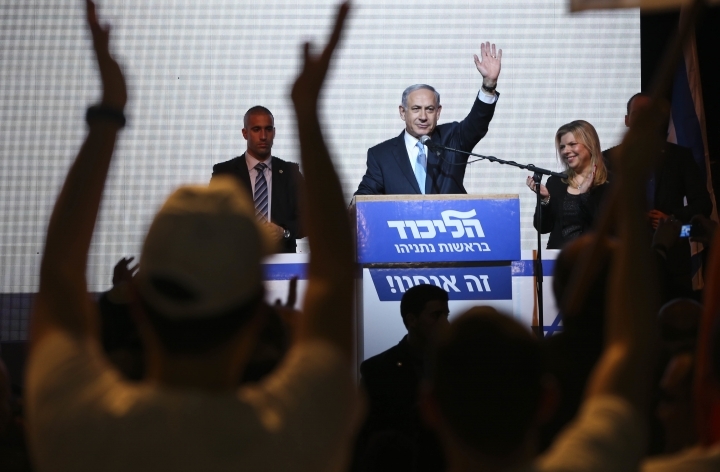 If indicted, Netanyahu can expect such calls to grow — whether there are elections or not.